One of the best things for me in owning the LocalsGuide has been all of the relationships I have been able to form with my clients. 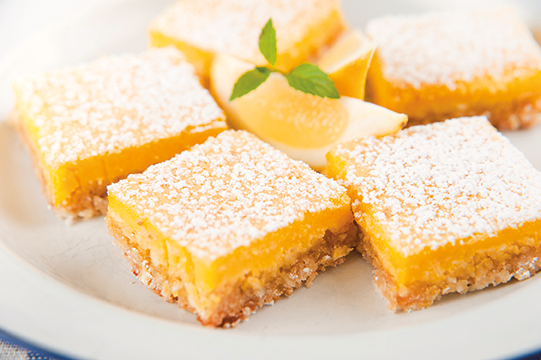 They come to LocalsGuide as a way of reaching and sharing with the community. They share their dreams and visions and we assist them in building relationships and marketing their services. 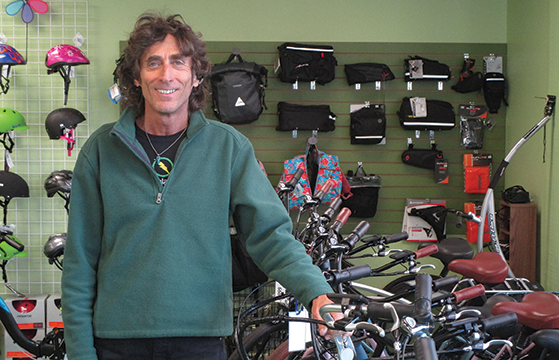 Nearly ten years ago Jerry Solomon launched Ashland Electric Bikes and shortly thereafter started advertising with me in the LocalsGuide. He invited me over to his house to learn more about what he was doing. I remember he brought out a prototype electric bike he was working on in his living room (that’s where it all started!). He showed me the controls and then took me touring through the hills of Ashland. It was a delightful and unforgettable experience. Jerry was certainly ahead of the curve in an industry that was in its infancy here in the U.S. Fast forward a decade and time is catching up with his visions for what is possible here in Ashland. The audience that Jerry envisioned has arrived. 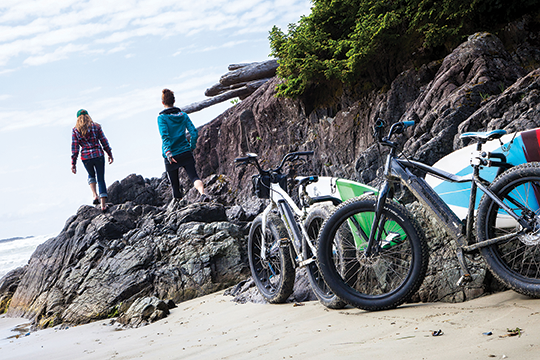 Spring is upon us, and it’s time to ride! I caught up with Jerry at the shop recently and here is what we discussed. Thanks, Shields. 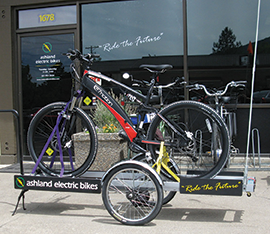 Yes, I am extremely grateful for all the early adopters and loyal customers that have made Ashland Electric Bikes what it is today. I started the business on a shoestring budget and have grown it into what it is today without a single loan or outside money and I’m proud of that. It’s been a measured, steady process and the resulting base feels very stable. I’ve done my best to provide quality products, thorough education, and stellar service and its proven to be a winning formula. Ten years in the industry speaks volumes. Please talk more about this. I’ve seen and learned so much in that time. Companies have come and gone and the equipment itself has evolved considerably. Virtually every day we discover something new about products and their maintenance that makes us better equipped in moving forward. Also, we have bikes that have been out there in service for nearly a decade and the real world lessons they’ve taught us can’t be found any other way. I know what distinguishes solid and durable from trendy and short-lived. (Laughing) I think most of my bike suppliers are both appreciative and a bit hesitant to hear our feedback whenever they present new products. We celebrate the strong points yet we’re also ruthless in pointing out the weak links. Some companies give us excuses, others give us upgrades. By this we know which ones are truly dedicated to building the best bikes possible and that’s who we want to represent. Truly, after all this time, its still exciting to open every new box to see what small or large improvement has been made to that bike. 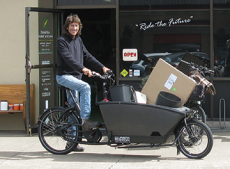 When I built my first electric bike back in 2007 it was a real eye opener for me. Long standing health issues had caused me to stop bicycling, something that has always been central to my lifestyle. That was a huge loss and I was determined to find a solution. My electric bike got me back in the saddle and riding like I was in my healthy 20’s again. It was a genuine epiphany and I knew I wanted to explore this new realm more. I also wanted to share my discoveries and help others reclaim their riding ability. That motivational piece, combined with the ecological/societal values inherent in greater bicycle usage, was, and continues to be, at the heart of the matter for me. I like closing my eyes at night knowing that I spent the day making somebody’s life and our shared world just a little bit better, healthier, and perhaps more in alignment with a Higher Order. In my hopeful idealism, I thought that electric bikes were about to explode in popularity the next day(!) and I wanted to be a part of that. Here we are ten years later and its really just now beginning to get greater attention on a national level here in the U.S. As I said earlier, I knew firsthand what a game changer electric bikes could be for individuals, and for communities as a whole, and I really wanted to help propel that movement forward. That’s absolutely true. Battery technology improvements are certainly foremost in that regard. Motors, electronics, and diagnostic capabilities are also more refined. As the numbers grow, bigger companies are getting involved and bringing their more sophisticated design and manufacturing expertise to bear. Alas, there’s also a proliferation of poor-to-mediocre offerings out there as well. Let the buyer beware; if the price is low and it seems almost too-good-to-be true, it probably is. Our region’s topography and climate require more from an electric bike than say a customer in Topeka, Kansas, so it’s advisable to look beyond simply the lowest price tag you can find. 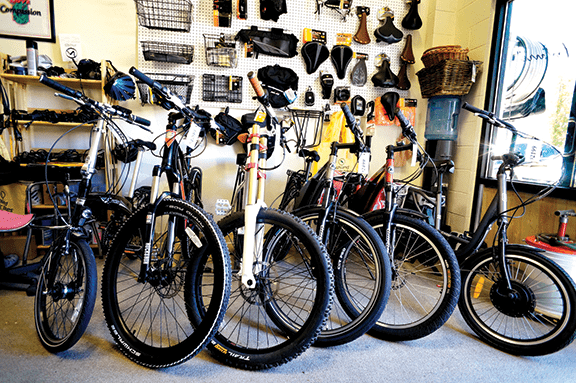 Sadly, there still exists a throwaway mentality around many consumer items, so yes, you can buy an ebike for far less than the bikes we offer and yes, you will be scrapping it in far less time than you would if you start with a quality item. Forget getting a first car. Get an electric bike. That’s just what I like to say! It thrills me to see more young folks and their parents choosing this option. What a great graduation gift it can be to send your young adult forward on an ecologically friendly, socially conscious path in life! Globally, more and more young people are forgoing the expense and hassles of car ownership in exchange for alternative solutions such as electric bikes. 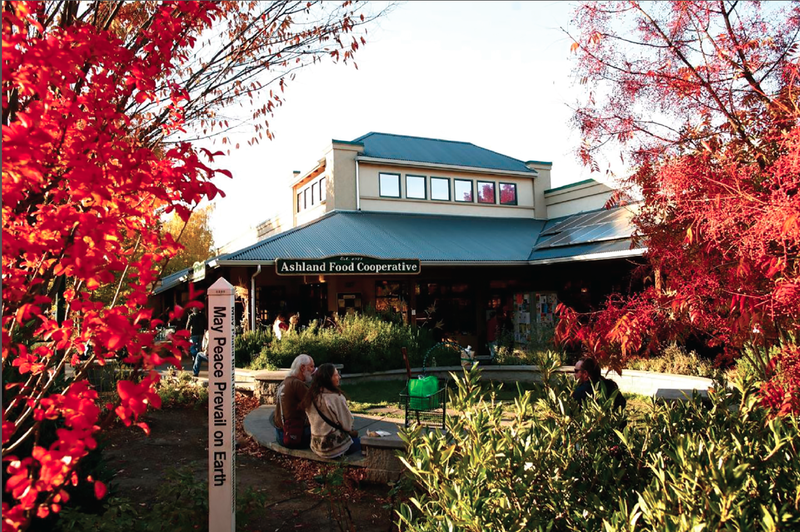 Ashland is the perfect size community to make this lifestyle possible. Having access to a car when its necessary while doing the majority of your daily traveling by ebike is the ideal scenario in my opinion. When approached from this perspective, the higher costs of a quality ebike become more reasonable. In fact, one study in the San Francisco area determined that the cost of a $5K electric bike (that’s a VERY nice bike! ), when factored against the average expense of owning and operating a car, would be recouped in only nine months time. 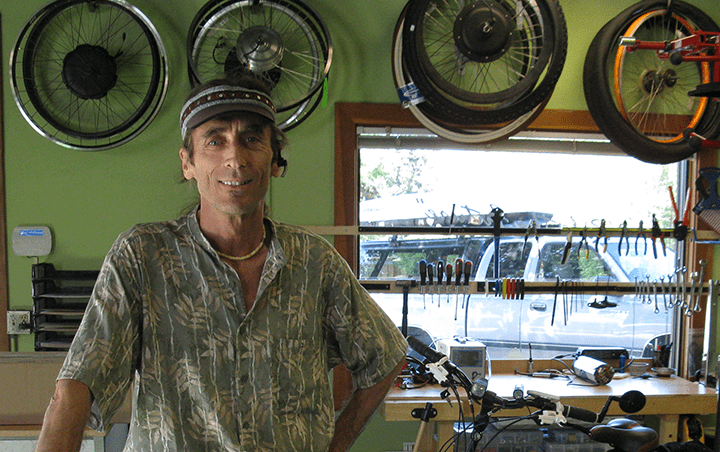 We have so many stories of people able to bicycle again after an injury of some sort. 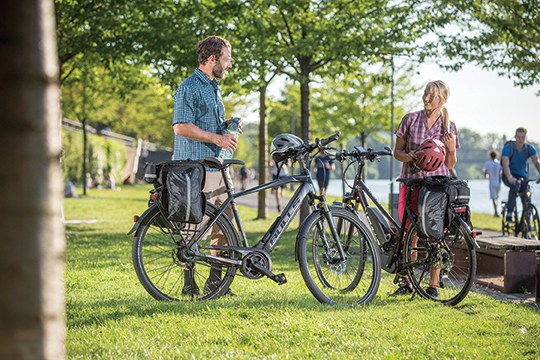 Countless couples have been able to begin riding together as a result of one or the other using an electric bike to balance their capabilities. 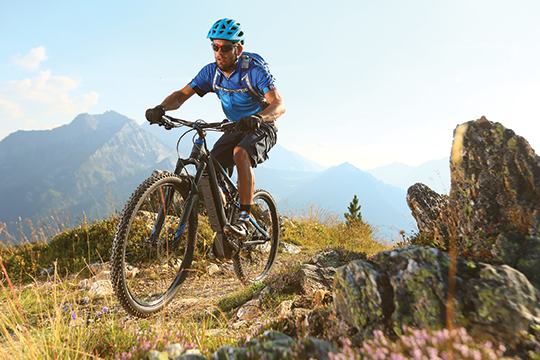 We see adults who haven’t ridden since childhood regaining that sense of freedom and joy that riding a bike provides. We recently equipped a local landscaping business with a handful of beautiful bright red cargo bikes to serve as their fleet of vehicles for servicing local projects. Congratulations, Jenny at Ahimsa Gardens for your forward vision! Oh boy; my mind begins racing with this one. There is so much potential for growth in this arena. First of all, community infrastructures and basic growth design criteria need to keep evolving to encourage more and more bicycling and pedestrian friendly areas. We need only look as far as many European countries that embrace bicycling more than us to see how much that can improve the quality of life for the people at so many levels. 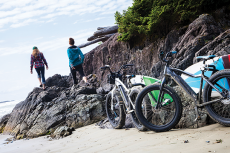 Moving forward, electric bike usage and car share programs will dovetail together perfectly. Also, so many businesses can incorporate electric bikes as their short-range delivery solutions and provide incentives for employee travel via bicycle. Government incentives like we see for electric cars will be a big boost to the movement. 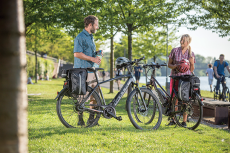 There are unlimited recreation-based opportunities for growth in the way of electric bike tours, group rides, community bike maintenance classes, etc. 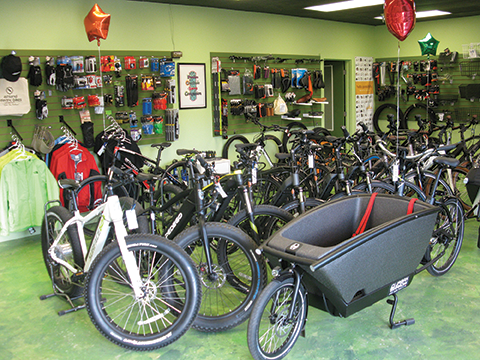 I envision a day when electric bike shops are more akin to today’s car dealerships and service centers in terms of their sophistication and greater presence in most people’s lives. 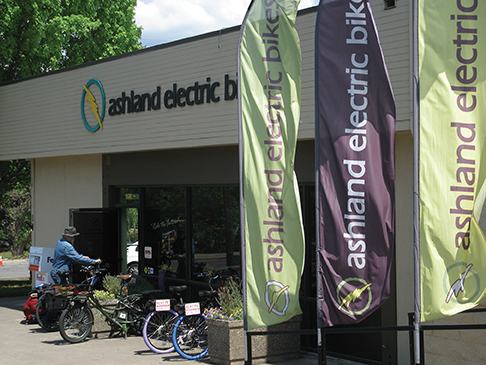 Whether its myself or the next steward at the helm, I expect Ashland Electric Bikes to continue leading the way locally and regionally. Again, I want to thank my loyal customer base for their support in co-creating this first decade of success. I’d also like to invite everyone to look at their current vehicle usage and consider the alternative options that an electric bike in the mix offers. More bikes and fewer cars on the road benefit us all. In these wildly tumultuous times, with the many seemingly intractable powers-that-be in control, it can feel like its impossible to affect any real change at the personal level. However, I believe that just the opposite is the greater truth, that the actions of individuals ultimately do combine to create the experience of the whole. 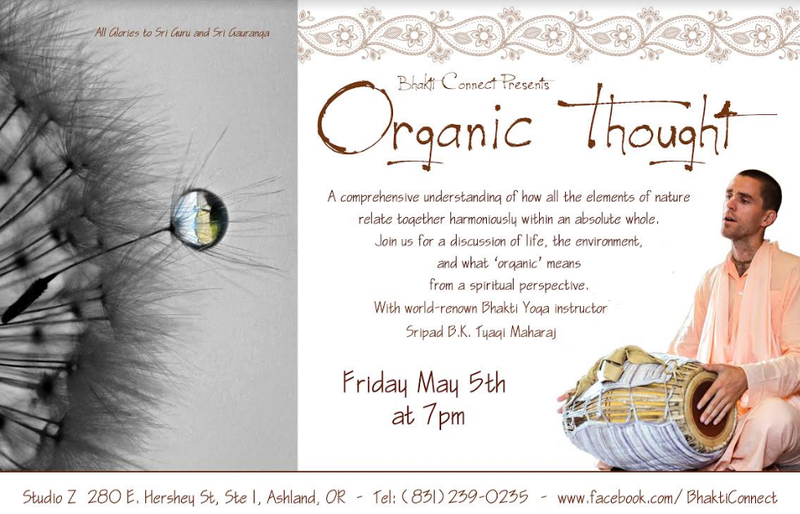 The place is Here and the time is Now. 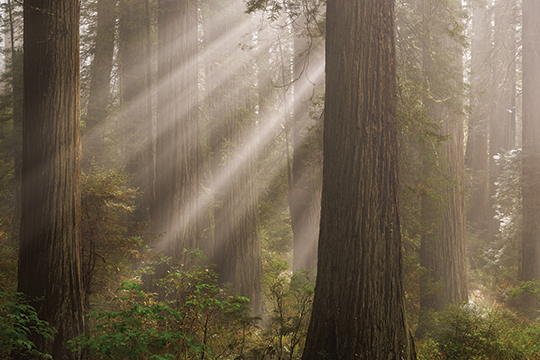 Do what you can to make it an even more beautiful world.